Dog flea control is one thing you need to know about if you are lucky enough to own a little four legged friend, as it is the most common external parasite that your dog will experience. Prevention is the best approach to fleas so establish a regular program of treatment, this should keep most dogs flea free. I know some owners with dogs that have problems picking up fleas, this may depend on the area you live in or perhaps your dog is more susceptible to fleas and sometimes it can develop into a larger problem of a flea infestation. We have put together some information that you should find helpful in your fight against fleas. Does my dachshund have fleas? 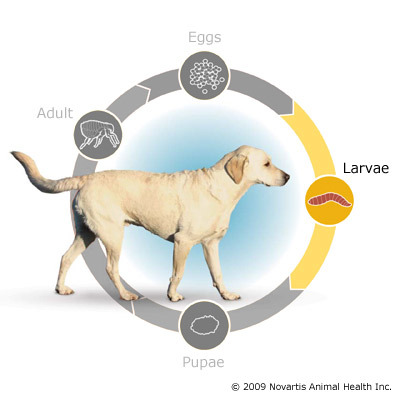 Fleas are very small and have a fairly complex life cycle which mostly happens away from your dog. In using successful dog flea control methods, I always think the more you know about your enemy the easier it is to win the battle. The beginning of it all is the egg and the typical cycle lasts about six weeks. Flea eggs are very tiny so are difficult to spot, one female can lay 20 eggs at a time and over a life time can produce thousands of eggs. These eggs hatch in 2-14 days depending on the conditions eg temperature and humidity. Often found in carpet and bedding. 2 -18 days when the larva spins a cocoon and becomes a pupa. The pupa is covered in armor like cocoon and is almost impossible to kill. They settle in carpet, between floor boards, in furniture and bedding. The annoying thing about this stage I feel is that it can last from a few days up to one year. The fleas hatch from the pupae when they detect a host, this is when most people become aware of the fact there are fleas around. 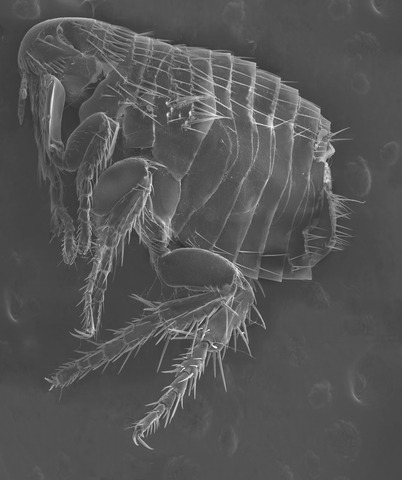 Adult fleas live about 2 - 3 months but sometimes up to one year in ideal conditions. I think it is interesting to note that one meal can last an adult flea about 8 weeks. For every flea you find on your dog there are approximately 100 more in various life stages in your home environment just waiting to become adults and jump on to your pets or perhaps even you. It is usually adult fleas you find on your dog as although eggs may be laid in your dog’s hair they soon fall off anywhere around the house. Does your dachshund have fleas? Why is your dachshund scratching? Does my dog have a flea problem or is his skin irritation or another problem, let’s find out. First check the dog carefully, bath time can be a good opportunity to do this. Use a fine flea comb to comb his coat, fleas are tiny they are not always easy to find. Dog Flea Control Handy Tip - If you are still not sure, try this. Wet a sheet of white paper place your dog alongside it or on the paper. Using a flea comb, comb the hair on the small of your dog’s back, ensuring any hair, scurf or flea droppings go onto the paper. Flea droppings resemble coal dust, after a short time if this turns reddish brown then this is dried blood, proving that your dog has fleas. 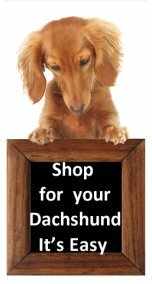 By letting our little dachshund into the outside environment, taking him for a walks or to playing with other dogs we risk them coming into contact with fleas, did you know, fleas can jump up to 13 inches or 33 cm. But we don’t need to stop our dachshund’s fun and exercise, with good understanding of dog flea control, regularly checking and a preventative program that is administered regularly, then we have done all we can and your dog should not have a flea problem. We all lead busy lives so to ensure you maintain the preventative treatment program on all your pets for parasites I find a reminder on my calendar helps me know when the next dose is due. Grooming and bathing is the number one in my book for protecting your doxie from fleas, as we will be aware immediately of the problem and using a flea comb makes this easier. Something as simple as vacuuming your house on a regular basis helps keeps fleas in check, and this means eggs, larvae and adults. Remember to discard the bag in a sealed plastic bag after vacuuming. Ensure your dachshunds bed and bedding are washed regularly in hot soapy water. As most people would be aware fleas are more active in the warmer months of spring and summer. In colder climates if your home is centrally heated then this provides a particularly good environment for fleas to develop, this fact is easy to overlook. Fleas not only cause discomfort by biting your dachshund, which makes them itch, but it can also lead to other health problems such as skin allergies, Lyme disease and spread of tapeworms. If your doxie does not seem to be getting rid of the fleas then expand your dog flea control area beyond your dog, as you are probably killing the fleas on your dog, but he is getting re-infested. There are three main areas which must be treated to get rid of fleas. If you find you are dealing with a flea infestation then you need to treat all your pets and the environment at the same time. By understanding the flea life cycle you will know that treatment needs to be repeated in six weeks to allow for immature fleas to develop into adults otherwise your pets will keep getting re-infested. Pets – Bath, groom and treat regularly. Home - vacuum and wash floors then treat with suitable product. Wash all pet bedding. Vacuum and treat all areas where your dachshund spends time, move furniture to expose cool, humid areas where fleas hide especially carpet areas, lounge furniture and beds. 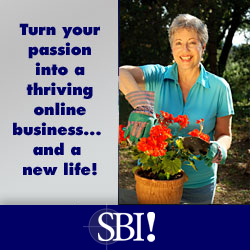 Outdoors – Clip any long vegetation areas and move debris that forms dark, moist areas and expose to sunlight. Use suitable outdoor flea products on decks, in cracks and crevices in concrete, wood, tiles and grass areas. Use a flea trap to monitor your success, see about traps on Natural Flea products page. Ensure products you choose cover not only adult fleas but most life stages. A suggestion I recently heard about fleas are apparently attracted to the color white so perhaps walk around the house in white sox to check if fleas are still active. It is not necessary for dogs to show a visible flea problem to develop a flea allergy as only one bite is enough to start an allergic reaction. It is interesting to realize that some pets are allergic to flea spit which contains chemicals that stop the blood clotting while the flea is feeding. It is these chemicals that can cause an allergic reaction on some dogs, they develop severe itching and by scratching and licking themselves the skin gets inflamed and sore. This may develop into a crusty rash so is most unpleasant and irritating. This allergic reaction may last some- time after your dog flea control has dealt with the fleas, so you may need some treatment from the vet until it settles down, some dogs with severe allergy may need year long treatment. As no doubt you are aware there is a wide range of products available to help you with your dog flea control, such as powders, tablets, sprays, drops and shampoos check out our Canine Flea Control Products page for some of our recommendations. Some products may prove more effective than others and some may suit your dachshund better. It is advisable to know what stages of flea development the product you are using acts on as some only kill adult fleas while others kill adults and immature fleas. It may be necessary to use a combination of products to stop immature fleas developing and re-infecting your dog. Some dog owners treat their pets on a regular basis with a topical treatment like Frontline, but still have fleas around. If that’s the case then you need to widen your treatment area to include everything and everywhere your dachshund spends time. There are also a range of products available for killing fleas in your home environment, powders, sprays etc. Some owners today feel that they would prefer to use flea treatments that are natural and non-toxic,as they are concerned about the use of chemicals on their pet and in their home environment. If you are interested in checking out an alternate natural approach to dog flea control then go to our page on Natural Flea Killers.